The version 1.8 was submitted for review to Apple on January 20th, 2011. The problem with the decimal button is fixed. 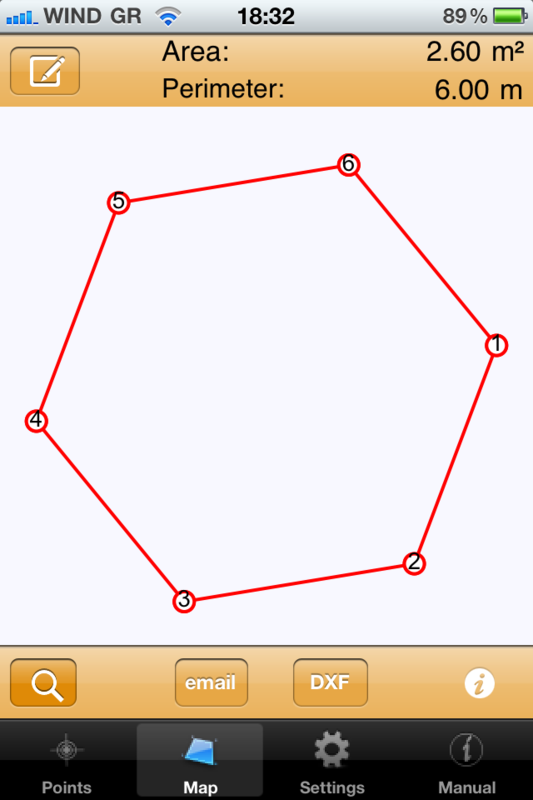 Let's consider the simple geometry of a perfect hexagon, like the one shown in the figure. The first thing that you will notice is that we changed the way we depict the number of a vertex. Do you like it? We believe that you have found yourself in the situation where you need to calculate the area of a sub-region within this hexagon. If this is the case, how will you calculate the area of the triangle with the points 4,5 and 2 as vertices? How will the area change if you add a fourth point (i.e., 1)? Not an easy task, right? Did you notice the button in the top left corner? 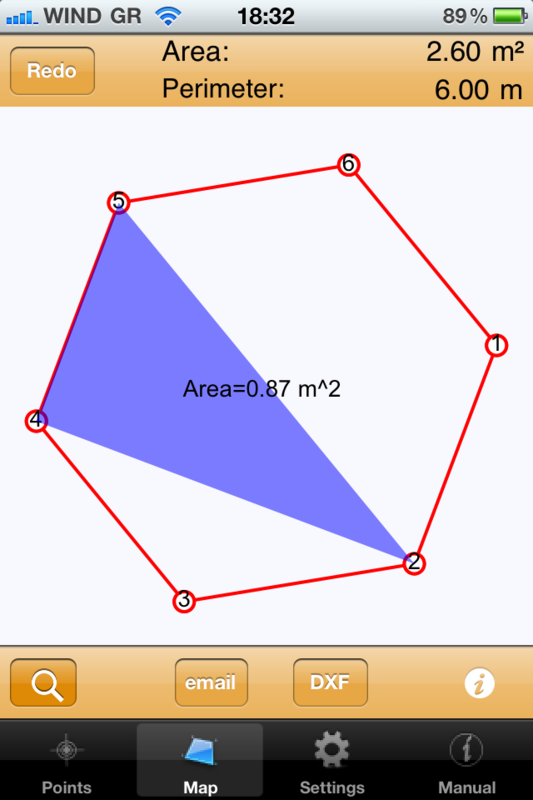 This version offers an exciting new feature: It allows the user to calculate the area of any sub-region by simple selecting the points that define this region. The interesting thing is that this calculation is happening on the fly, as you select the points, and the value of the area is immediately updated. There is one restriction, however, you need to select these points in a (counter)clockwise direction. As simple as that!! In order to select the points you need to click on the button in the top left corner. You select a point by clicking on the map. Once you have selected more than two points, you will start to see a drawing of the sub-region, as the one shown in the figure. 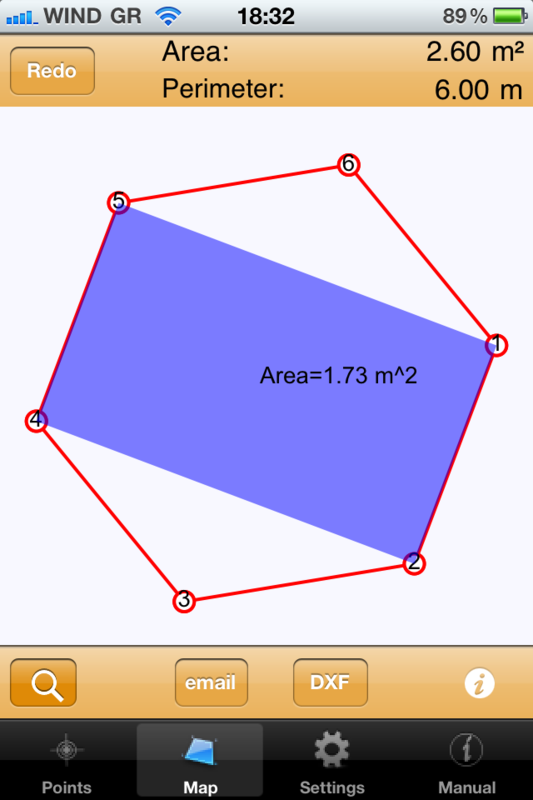 If you click on a fourth point, then the drawing and the value of the area are updated. If you wish to move/rotate/zoom the map you need to click on that left button (which now is named "Redo"). As the name suggest, this button allows you to reset your calculation. This does not happen immediately, but if you click on that button (for a third time), the drawning will disappear, and you are starting all over again.